Apple gave Maps a complete makeover in iOS 6—one that included removing Google as the app’s back end and the elimination of local transit directions in favor of third-party apps. By comparison, the changes to iOS 7 are subtler, though sadly, transit is still MIA from the Maps app other than via third-party apps. Instead of the old page curl from iOS 6 and before, iOS 7’s Maps has an info button that you tap. 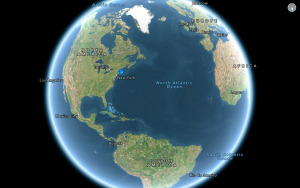 As with the rest of the OS, Apple has updated Maps with a non-skeuomorphic aesthetic and a simpler interface. The toolbar provides buttons to show your current location, switch into 3D mode, and share a location (using Messages, email, Twitter, Facebook, or AirDrop), add a bookmark, or send directions to another iOS 7 device via AirDrop. Maps’s other options, which formerly resided under a page curl in the bottom corner, can now be accessed using the Info button. Some of these refinements also add features. 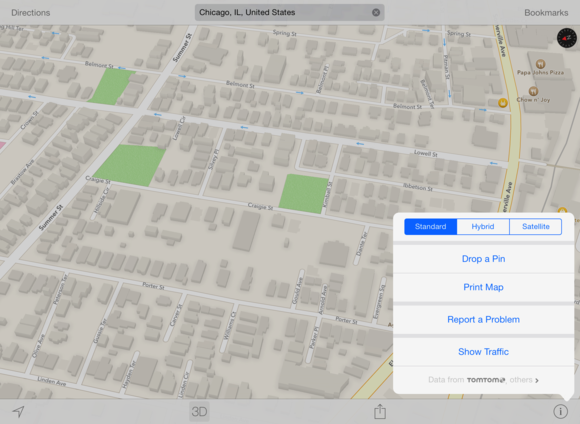 For example, tap the screen once, and the toolbar and search bar slide away, giving you a full-screen view of the map. At night, the interface for driving directions automatically changes to dark blacks and grays, making it easier to see. A scale graphic appears when you zoom in on or out of a map, giving you an idea of how the map translates to real-world distances. Tap the search bar, and you’ll automatically see your recent searches. 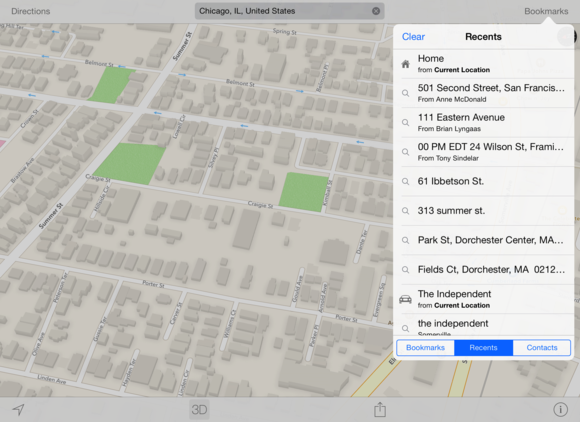 In these, you may spot unfamiliar addresses with “From person” listed—these are addresses Maps has automatically pulled from your recent iMessages or email. In addition, all your recent searches will now sync between your devices via iCloud. Recent searches not only now sync between iOS devices via iCloud but also shows you addresses sent to you by friends. Search for a generic term, and a fifth button—List Results—pops up on your bottom toolbar, such as “pizza.” Tap it to see a list of your search results; tap an individual one to view its place on the map and summary. Whether you search for a generic term or specific location, you’ll see a few changes upon tapping the location’s red pin. The Quick Route button now gives you an estimated travel time indication, along with an info button to the right of the destination. Tap Quick Route and Maps will provide not only choices for driving routes, but walking directions if it determines that the location is within walking distance. In the Settings app, you can now choose whether you prefer driving or walking as the default for directions. 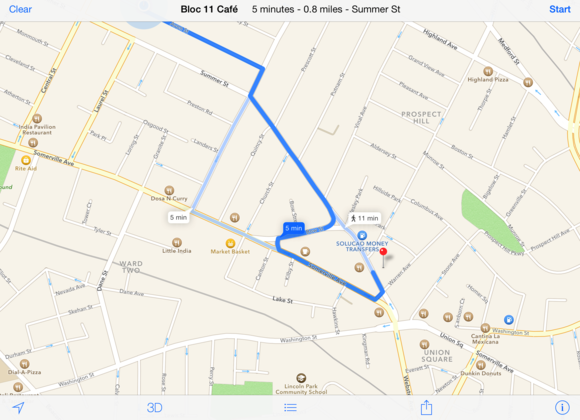 Plotting a route to a close by location will show you options for walking and driving. In addition, the info pane for a specific place now lists a new Transit Directions option. (Like all other transit information in iOS’s Maps, it currently kicks you out to a list of third-party apps, either on your device or on the App Store.) The Share button in the location view has moved to the more easily accessible top-right corner, and you have separate options to add the address to an existing contact or create a new contact. There’s also a scrollable list of Popular Apps Nearby; you can tap any item to see an App Store page for it.